Finally I have done ALL the badges for MFF!!! 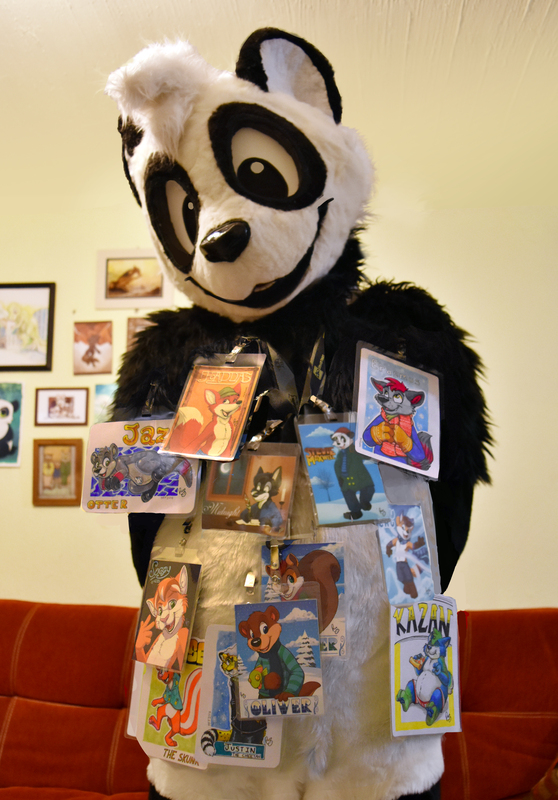 And as those guys who are wearing like 30 badges ALL at the same time at conventions, that look more like a christmas tree (I've seen many of them, hehe, it's not bad, it's good to show off your badges but I consider it very funny), this is my representation of them, wearing all the badges I did as commissions. Which are ready to hand them: printed, laminated and with its clip. I'll see all those guys at MFF2016 on Rosemont, Illinois. Oh my gosh your just so cute and fuzzy I wanna snuggle you! I wont be able to make it to MFF but I hope to see you at AC2017. Badges, we don't need stinking badges! Now if I can only remember what that's from because me and my father say it all the time. Love the reference to Weeble. Come and see me at the upstairs infodesk!